Christian Colon, Bryce Brentz and Patrick Kivlehan homered in the win. Just a year ago, outfielder Bryce Brentz led the International League with 31 home runs for the Pawtucket Red Sox. 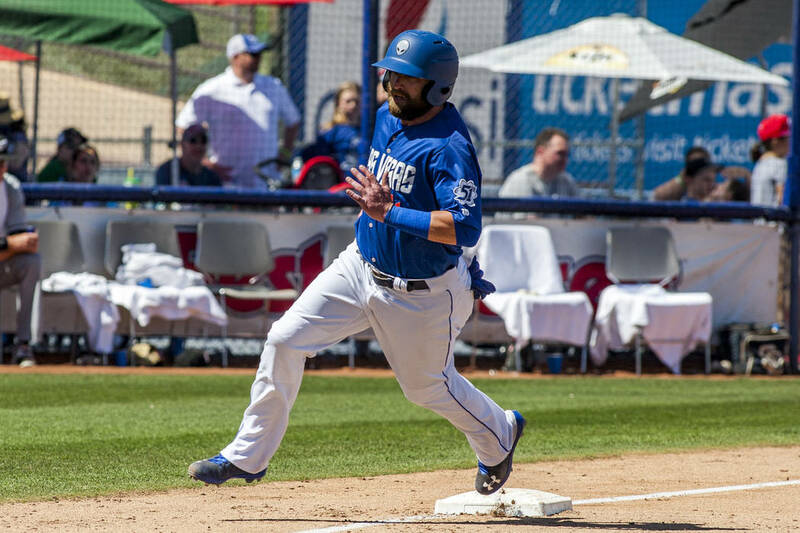 But the slugger, who has been sidelined for months with a foot injury, wasn’t hitting third or fourth for the Las Vegas 51s upon his return. In his second game back, Brentz was hitting seventh in a lineup that is likely now more powerful than it has been all season thanks in part to his return. Brentz was one of three who homered for the 51s in their 6-3 win over Omaha on Thursday night at Werner Park. Infielder Christian Colon was the one who got the 51s (53-57) going with the first home run of the night to open up a scoreless game in the second inning. After a Matt den Dekker double, Brentz hit his first home run since the beginning of May. Patrick Kivlehan also added a home run for Las Vegas in the seventh inning. The 51s scored two more runs in the fourth inning on a Kivlehan sacrifice fly and Colton Plaia single. The bottom of the order for the 51s — den Dekker, Brentz, Kivlehan and Plaia — went 8-for-15 with each collecting two hits. That was enough run support for Drew Gagnon, who kept the Storm Chasers (50-59) off the board for the first four innings of the game. Gagnon gave up a pair of runs in the fifth and one in the sixth, but tossed a quality start as he went six innings and gave up just the three runs, minimizing the damage in a sixth-inning jam. Gagnon struck out four in the game and gave up just five hits. After him, Buddy Baumann, Tim Peterson and Chris Beck each tossed scoreless innings with Beck picking up a save in the process.